As smartphones make it easier than ever to stay in touch, the devices also become the go-to for helping loved ones keep tabs on each other, especially in case of an emergency. 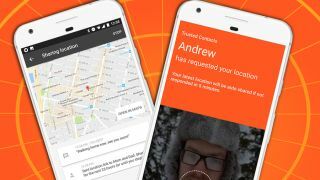 Google's latest app, called Trusted Contacts, grants a close circle of friends and family the ability to track your location in case something goes wrong - or just to let them know you're on your way home. After downloading the app, assign "trusted" status to your closest contacts. From there, those selected folks can tell if you've relocated recently, see if you've checked in following a disaster, or just keep an eye on you in a sketchy scenario, like walking alone at night. Should one of your trusted contacts on Trusted Contacts grow worried about you, they can also send a request to see your last known location, a feature Google claims will work even if the phone in question is offline. If all's well, the user has five minutes to cancel the request before the app automatically updates their location - giving the concerned requestee a place to start should taking action become necessary. Trusted Contacts is now available for Androids running KitKat or newer via the Google Play Store. Google is also working on a version for iOS and is accepting sign-ups to be notified when the app hits Apple devices.